Well, you might. And if you do, it will be our pleasure to serve you. But we’re not in the business of selling people services they don’t need. 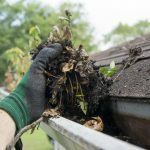 In this edition of the Complete Gutters blog, we’ll cover ways to identify whether it’s time to get your gutters cleaned. Let’s start with one of the more telltale signs that your house’s gutters are in need of a good cleaning. 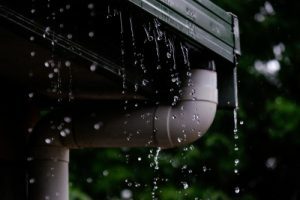 If you see water pouring (or even dripping steadily) over the side of the gutter, it’s time to clean out those gutters! After all, properly functioning gutters do the important job of draining rainwater (and melting snow) off the roof and away from the building. That keeps your roof in good shape, extending its lifetime and minimizing damage caused by leaks. It also protects the siding of your home. When the gutters get clogged – and this can be by all kinds of debris, but more commonly from leaves, branches – the water flow slows down or stops, and pooling & flooding begins. A thorough gutter cleaning will restore the functionality and flow, giving you peace of mind that your home is in good shape. Looking around the exterior of your home, on the ground near the building, do you see any puddles or pooling water? If so, your next step is to determine the source of these puddles. If nothing else is apparent, there’s a good likelihood that water has spilled off your roof (due to gutter blockage) and caused this standing water. If rain is in the forecast, (and hey, we’re in BC, so there’s a good chance of that!) you can wait until the rain starts and then go out to confirm that it’s a gutter block. 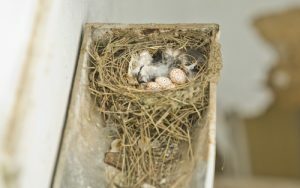 Are animals and birds treating your gutters like a home or a fort? That’s not a good sign! Chance are they’ve found a water source, especially if they’re returning again and again, and bringing more of their friends. Same goes for plants and weeds. If you’ve got things growing out your gutters, there’s got to be a water source. 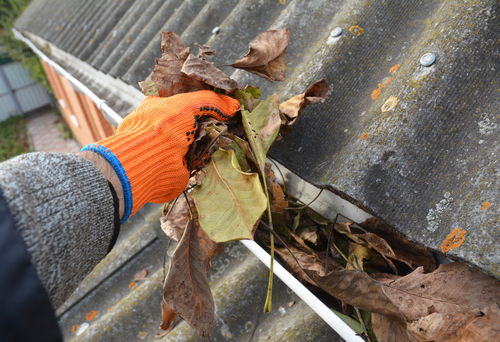 All this points to blocked gutters that need a good cleaning… the sooner, the better. Gutters are built to carry flowing water. They have a tendency to sag or buckle, however, when stagnant weight is present. Debris such as leaves and branches don’t necessarily weight that much – but water does! So if you’re seeing sagging gutters, there’s probably a block that’s causing water backup. Letting this go too long can result in the gutters bending or even breaking, requiring repair or replacement (which we do perform, but we’d rather help you prevent this from happening). In addition to the damage potential already mentioned, standing water in your gutters resulting from blockage can lead to mold, mildew, rot and other costs that you don’t need. If your gutters are blocked, contact Complete Gutters today and schedule a gutter cleaning in Vancouver or the Lower Mainland. After all, your home is your greatest investment – we’re here to help you maintain and grow it!